All three commissioners are wary of repeating the mistakes they say county and city officials made more than 20 years ago, when new stadiums for the Bengals and Reds saddled county taxpayers with huge financial obligations. “We’ve all lived to regret that,” said Commissioner Todd Portune. Fellow Commissioner Chris Monzel said building stadiums, including the two the county already owns, shouldn’t be the business of county government. The commissioners did not, however, rule out the possibility of helping proponents of a new arena and soccer stadium, even if they don’t approve a large public investment. While putting a higher sales tax on the ballot is the most likely way to raise big money, the county and city could pursue more modest measures, such as donating land, granting tax breaks or seeking help from state and federal grants. 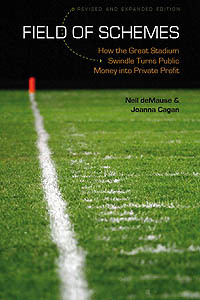 So it appears the commissioners just don’t want to own a new stadium, but they’re maybe open to giving it public money? Or, more likely, they’re sending a signal that $100 million is a lot of money, and raising the sales tax just to renovate an arena that only really needs minor upgrades is a little nuts, but maybe ask for less and we’ll consider it. Which could be a reasonable “let’s not close any doors” approach, or could be a way to tell constituents that they’re not throwing money down any more stadium holes while secretly considering doing just that, or a combination of the two. This entry was posted in Cincinnati arena, F.C. Cincinnati by Neil deMause. Bookmark the permalink. How do these people get re-elected? It looks like the U.S. Bank Arena Sales Tax hike is DOA. And the odds of FC Cincinnati getting their desired Sales Tax hike don’t seem much better. Our group (No More Stadium Taxes) will keep fighting until both of those sales tax hikes are dead for sure. The most likely way U.S. Bank would get anything is if the electeds pursue an idea to combine a convention center expansion with a rebuilt arena. Then you’re getting a public facility and a private arena melted into one project, with finances mixed, and then there’s a real possibility it gets structured in a way where the private owners come out well ahead. We’ll keep our eye out for this.